When I first heard about the Upsee, I knew I wanted to be a part of the trial. A device that would allow Sebastian to walk with me, attached to a vest and harness, just made sense. Ever since he was a baby and first started to bear weight and walk, we were holding him up. He does not have the upper body strength to do it on his own, his muscles cannot work together and give him the balance and strength he needs, so we were that strength. Hunched over, we held him up, hands under his torso, so he could move one leg in front of the other, because that’s what babies and toddlers do. They learn to walk. We were so excited at his ability to move his legs but what made us happier was his own happiness and the excitement he felt with each step. Fast forward to today. Sebastian is almost six years old and uses a wheelchair to get from one place to the next. He also uses his Kid Walk walker to walk the halls at school and around our home on the weekends. He especially likes walking outside in the summertime and kicking a soccer ball around. Although his Kid Walk does have a fairly open front, he is still very well supported, which means he’s surrounded by the equipment itself. He still gets excited with each step and loves moving around. It give him a sense of independence. But we can’t take his walker everywhere. He can’t get up a hill in it. It doesn’t fit in our car with his wheelchair and luggage when we take a road trip to see his grandparents and cousins every few months. It stays at school during the week. This piece of equipment that gives him independence, as well as therapeutic exercise, has its limitations. When we take a walk to the park as a family, Sebastian is in his stroller and his dad gets him out and helps him walk from the swings to the slide. He is hunched over, hands under Sebastian’s arms, holding him up. He then goes down the slide with him, or sits on the swing with him. Including Sebastian in everyday activities that all children his age experience is important to us. We modify whatever we need to to make it work. As Sebastian grows, even though he loves to cuddle, he doesn’t necessarily want to be carried everywhere. As a young child, it’s also important to me that he’s not in his wheelchair all the time. Especially when he was in pre-school and his peers would often engage in play at floor level. I want him to be in different positions to help him grow and develop. I want him to be invited and included in his peer groups whenever possible. Enter the Upsee. A product invented by a mom whose son also has cerebral palsy. A mom who wanted to walk around the neighbourhood with her son, but didn’t have access to equipment like a Kid Walk. A mom who wanted her son to learn what his legs were and what they could do. A mom who wanted to go camping and involve her son in family activities. The Upsee is a vest, harness, waist belt and double set of sandals. It is a device that allows a child to stand tall, while being connected to a parent who holds them up, hands free. Both feet are side by side and the action is similar to a child standing on your feet to dance, but they are parallel instead. You work together to walk together. But your arms are free, and your child is facing the world, no barriers. The first time I used it, I struggled. I wanted to walk and I wanted Sebastian to walk. Instead, I had to wait for his cues. I had to be patient and let his feet take the lead. Otherwise we wouldn’t be in sync. Once I realized this, I could feel his left leg struggle since his hip is somewhat displaced. I felt his right leg leap forward with ease. And we walked around our home. We walked through places that his walker doesn’t fit. He saw things from a different perspective. We counted steps and he got excited, picking up the pace a bit. When he tired, we stopped and stood together for a break. As we did so, his younger sister came toddling up to him, threw her arms around him and gave him a big bear hug. After the shock of such a spontaneous interaction between my children, I helped him hug her back. The following week, his sister asked me to stand Sebastian up every day when he came home from school so she could hug him. She can’t hug him when he’s in his walker. And often, she’s trying to help push and steer him. When he’s in the Upsee, she comes and grabs his hand and walks next to him. Recently, I was invited to attend the Upsee launch in Northern Ireland with a group of other parent bloggers. I took my family and the Upsee with me. 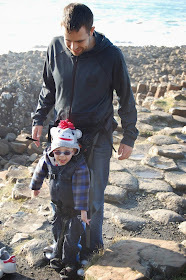 We decided to make it a family holiday and did some touring around, including a trip to the coast and the Giants Causeway, which is full of hexagonal shaped rocks leading into the water, like a bridge trying to connect Ireland and Scotland. Although the path to the Causeway was paved and accessible by bus, we chose to take Sebastian in the carrier and brought the Upsee along with us. Once there, he was able to walk along the rocks with his dad (see photo above). I also carried him on my back in a carrier and enjoyed that. But it was difficult for him to see over my shoulder all the time. When he was in his Upsee, he could feel the sun on his face, felt the uneven ground beneath his feet. His chest was stretched wide open in his vest, which is important since he tends to hunch forward, especially in the carrier. At one point a new friend asked us to pose for a photo. Suddenly, I was overcome with emotion. Here we were, all standing together, in an exotic, rustic locale. I wasn’t holding him. We weren’t crouching down to be next to his wheelchair. We were all standing there. Together. After the Upsee launch, the media posted a photo of three beautiful children, whom I had the pleasure of meeting, standing tall and taking steps in the Upsee with the support of their parent behind them. The photo has gone viral in the special-needs community. Everyone is very excited about the opportunity these children have to explore the world around them in a new, very inclusive and interactive way. And everyone wants one for their own child. I am so excited to be a part of the buzz and help get the word out about the Upsee. I had the pleasure of meeting the team behind the Upsee and touring the factory where it is made by local folks in Belfast, making a living wage. The company believes in its product and wholeheartedly wants to make life more accessible for kids with physical disabilities and make sure they can be included. It feels wonderful to be a part of something that can change the lives of so many families. Yet despite all the positives, I have read some negative comments about how the Upsee is trying to ‘normalize’ these kids into walking in a society that places such importance on walking. Although I can respect this point of view, I don’t see the Upsee in this way at all. I see the Upsee as an accessory that can make certain things, like travelling and off road adventures, more accessible. I see it providing Sebastian with therapeutic exercise which is especially important when we are away from home and don’t have access to his walker or other standing equipment. I see us taking it to the park so that his dad doesn’t have to bend over to hold him up to walk around, taking a break from his stroller and interacting with his sister and other children. I don’t see it as something that is trying to ‘normalize’ children who cannot otherwise walk. I don’t think that it says walking is better than using a wheelchair. I see it as something that can complement our lives, which can otherwise be restricted by obstacles. I think it also supports independence, even while being supported by an adult. I don’t think it says, "You are broken, I’m going to fix you, because walking is better." My son loves walking. He wants to walk. He needs help to do it. He also likes being in his wheelchair, probably because we refer to it as his Red Racer and he goes fast in it. But also because it gives him the support he needs to eat and do another activities he cannot do independently, and he knows that. The Upsee is designed for children aged two to eight. This is a huge time period for development for children. Having access to different positions, experiences, and peer relationships is imperative for optimal growth. The Upsee helps with all of these. I see Sebastian’s happiness in walking and interacting with the world around him in a way which feels free of barriers, echoed in the smiles of the other children I have met using the Upsee. I want my child to be included, in everything. And the Upsee helps make that not only possible, bit easier. Loved meeting your beautiful family, loved reading this—so powerfully said, Kara. I couldn't agree more about the Upsee giving children an opportunity to interact with the world around them. It hardly seems like something that's about "normalization." I'd venture to say that most any parent who's ever had a child with disability has ached to help them get around in whatever way they can. I think as a parent it is expected that you would want to give your child any piece of equipment that will help him to have more life experiences be included more, and generally be healthier. It is no more trying to "normalize" a child than having him use a walker or putting him in a "stander" is! This sounds like a great invention and I hope a lot of children are able to get use from it.